Well, like any other diet program, the followers of the GM diet too have got many questions in their mind. Few people were asking their doubts through our comments section, but many were sending us their queries through mails. Since, a lot of the questions were common for many; we’ve decided to write a separate FAQs post that answers all such common doubts raised by the GM diet followers. Let us now get into the details. Q1] Can I have Tea or Coffee while on the GM diet? Ans] It is not recommended to drink Tea or Coffee during the diet as it can add extra calories to your diet. However Green tea is allowed. Here are a few green tea recipes for weight loss. 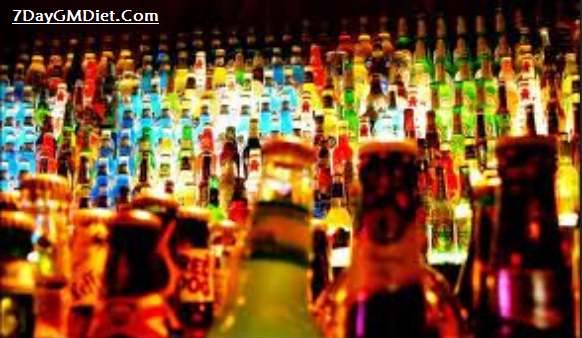 Q2] Is alcohol allowed during the diet? Ans] The main disadvantage of consuming alcohol is that it adds empty calories to your body without providing any nutritional benefits. Not only that, drinking alcohol causes water retention, thereby causing bloating and increased weight gain. There is a misconception among several exercise enthusiasts that drinking beer or alcohol after exercising strenuously recompensates the loss of water in their body, which is absolutely a myth and therefore such people put up a lot of weight instead of losing it. To better understand this concept, let us look at the calories your body gets when you consume alcohol. Beer – With an intake of one 12 Oz beer, you’re adding up to 150 calories to your body. At the same time a 12 Oz lite beer will give you 110 calories. Hard Liquor – When you drink hard liquor such as Vodka, Rum, Whiskey or Gin, you’ll be receiving close to 100 calories with 1.5 oz quantity. Wine – Of all the liquor family, Wine gives you a lot of calories. You’ll get 90 calories with 5 Oz of Wine which means with 10 Oz of Wine, you’ll be adding close 180 calories which is very high. Q3] Can Pregnant Women Follow the GM Diet? GM Diet After Delivery? Ans] Pregnant women require a lot of nutrients as she need to feed her baby and herself. Unfortunately, GM diet is a strict diet where you’ll be eating more foods with less calories and required nutrients. So, when the pregnant women follow the GM diet, they’ll be deprived of the nutrients that are required for the baby’s growth. This is the reason why women who are pregnant should not follow any diet or weight loss programs and should stick to the healthy foods in their regimen. Q4] Can You Follow the GM Diet after the Delivery? Ans] The answer is No! You should not start the General motors diet immediately post the delivery why because you’ll need all the nutrients to get back your strength and at the same time to provide your baby with the right vitamins and minerals required for her health. Hence, it is advised that you should not follow the diet until you’re done with your breastfeeding period. This period normally varies from one mother to another. Some mothers continue breastfeeding until their baby is at least 6 months old, while some stop it after a few weeks of their birth. Q5] How many Bananas can I eat on day 4? Ans] You can eat a maximum of up to 6 tiny bananas or 4 regular sized bananas but not more than that. Unlike the first 3 days of the diet where you eat limitless, from day 4 onwards you should only eat limited (suggested) quantities. Q6] Can we eat rotis like chapati, pulka, bread, cereal etc..? Ans] No! Since this is a gluten free diet, it is not recommended to eat wheat during the 7 day period. It may increase your weight instead of reducing it. Q7] Can I drink honey-lemon water daily in the morning? Ans] Yes! You can have it, but limit the intake of honey in the lemon water or else it becomes pure sugar water which in turn increases your calorie intake. Try to add more lemon and less honey (just a few drops to taste) for better results. 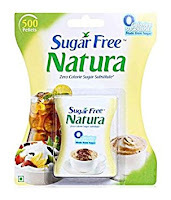 Q8] Can I Use Sugar Free Natura in Green Tea? Sugar Free tablets are usually made from sucralose, which is a derivative of sugar. The same formulae is used by the company ‘Cadilla Healthcare’ in their Sugar Free Natura tablets. If you don’t know already, sucralose is as bad as sugar. Here are a few side effects of sucralose found after thorough research by the experts. Increases the pH levels in the intestines. Decreases good bacteria aka probiotics by 50%, thereby causing severe constipation issues. Enlarged colon, liver, brain and calcified kidneys. Causes anemia (decrease in red blood cells). Decreased urination and thyroxine levels. You’ll lose important minerals like magnesium and phosphorus. If you’ll still thinking that these artificial sweeteners are good for weight loss? Then search for the term Splenda on Google. Q9] What are the Healthy Alternatives to Sugar? Since you’re not able to quit the sugar consumption, you can curb your sweet tooth by having stevia, organic jaggery or organic honey or unprocessed maple syrup. To say it simply, try to eat only the unprocessed form of sugar to be on the safer side. Q10] Is Stevia Naturally Safe? There are many people who take the side of Stevia and even call it as a natural sweetener and the best alternative to sugar. But, is it really safe to consume stevia? Although, we’ve been hearing about stevia very recently, the stevia plant’s history dates back to the ages and is being widely used in South America. 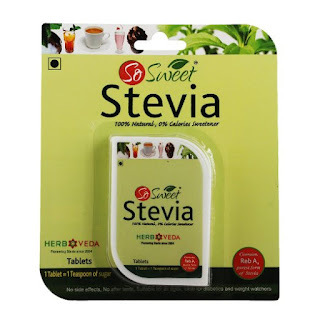 Most Stevia sweeteners include a highly purified stevia extract called ‘Rebaudioside A or Rebiana or Reb A. The Reb A is 200 times sweeter than sugar and the good thing about it is it does not raise blood sugar levels. The FDA has approved Stevia sweeteners containing Reb A as a safer sugar substitute, but not other forms of stevia. So, if you’re planning to get one, then read the labels and check whether it contains Reb A or not. However, as a safe note, please don’t exceed the consumption of Stevia or any other natural sugar substitutes. Just take it in limits and prevent weight gain. Q11] Can we add Salt, pepper and other spices to our foods? Ans] Yes! Enjoy eating your food by adding spices and salt. However, don’t go overboard with the salt. Use either sea salt or unprocessed salt in smaller amounts. Q12] Can we munch on dry fruits or nuts? Ans] BIG NO! Since these dried fruits and nuts are highly concentrated sources of food, they give you more energy (calories) than you needed during the diet. So, it is better you stay away from them at least while on the GM diet. Afterwards, you can have them in smaller quantities. Q13] Can I have yogurt or buttermilk instead of milk on day 4? Ans] Yes! You can replace milk with buttermilk or yogurt as long as you’re not adding sugar. Q14] On what days can we have the wonder soup or cabbage soup? Ans] You can have the wonder soup on all days of the diet. The main concept of the General motors diet is to lose weight without going hungry or starving. A lot of followers tend to have awesome results when they’ve incorporated the cabbage soup in their diet. So, whenever you feel hungry, count on the wonder soup. Q15] Since I am a vegetarian, can you recommend an alternative to meat? Ans] Of-course! There is a modified version of the GM diet for vegetarian followers. You can follow it and have the same results like the Non-vegetarians. Q16] Will I gain weight back once I finish the GM diet? Ans] Yes! If you’re planning to return back to your old unhealthy lifestyles after you finish the 7 day diet program, then you’ll obviously attain all the weight/pounds you’ve lost during the diet. No! If you took your health seriously and thus changed your lifestyle accordingly. Try to eat balanced meals i.e., instead of 3 big meals a day, you can have 5 or 6 small meals and each meal should comprise protein, good carbs and vegetables. Never opt for wheat or bread and always choose unprocessed foods. Also, try to incorporate this 7 minute high intensity workout in your daily schedule to maintain your weight. Q17] Can I have Corn Flakes for breakfast after completing the diet? Thanks to the advertisements on the TV channels and other media, Corn Flakes has become the best choice for those who’re looking to shed pounds. But, do you really think you can lose weight with corn flakes? Unfortunately, this is not possible, and cornflakes don’t aid in weight loss. Instead, they’re responsible to increase your weight. After watching the advertisements about how healthy these corn flakes are, a lot of people started replacing their regular breakfast with a bowl of cornflakes in milk. 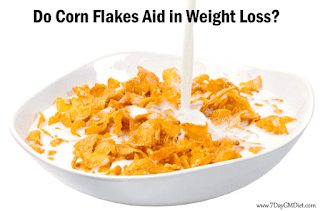 But, contrary to the belief, cornflakes are not ideal for weight loss. Let us look at the details for a better understanding. ‘Will Kellogg’ and his brother ‘John Kellogg’ has started developing Corn flakes with stale wheat in the year 1983. They first used the stale wheat to make dough, which was sent through a roller to get broken flakes. These flakes were toasted and served to the patients at a sanatorium. Luckily, the patients who ate these flakes liked them very much, and so the brothers improvised the recipe to make it perfect. That is how the corn flakes were born. Now a days, you’ll find a lot of brands on the market that claim their corn flakes are healthy and help you in losing weight naturally. Unfortunately, eating corn flakes is not a healthy option. Eating cereal for breakfast is the best thing you can do to reduce your weight, but that cereal should contain the right amount of nutrients, less sugar and fat. However, these branded corn flakes contain a lot of unhealthy ingredients like malt, sugar, high fructose corn syrup etc… Out of these, the worst ingredient is the corn syrup, which contains high Glycemic index carbs. This particular ingredient along with the sugar is not at all good for those who’re looking to shed weight. 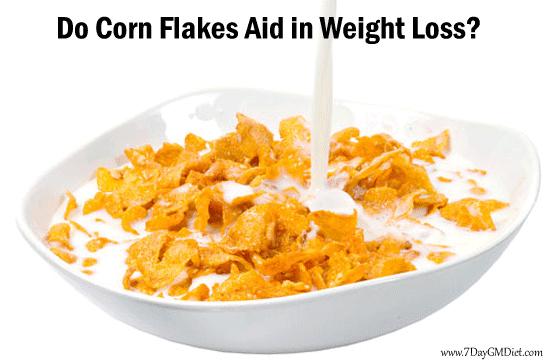 A lot of studies have found that intake of cornflakes regularly with milk and sugar/honey led to weight gain. Do Corn Flakes Contain Proteins? Well, this is also an advertising gimmick. Contrary to the index on the box, the iron content is less than what is mentioned on the corn flakes box. Since it is low in proteins, people would feel hungry within a few hours after eating the cereal. The UK health magazine has conducted a study on a group of kids with low glycemic index (GI), who were served muesli, porridge, bran and soya for breakfast, and high GI kids were served corn flakes, white bread and chocolate flavored cereal. Surprisingly, the high GI group kids felt hungry much faster than the low GI kids and they also ate more during the lunch. This proved that the corn flakes are not rich in proteins and an unhealthy breakfast for kids as well as for those who’re trying to lose weight. So, if you’re trying to lose weight, then first avoid eating those corn flakes and only concentrate on foods that are low in Glycemic index such as fruits, vegetables, whole grains, meat and beans. Also, do remember that packed foods are always unhealthy. Try to eat foods that are naturally available near you. Q18] Can I follow the GM diet continuously? or How many days gap should I take before starting GM diet again? Ans] No! You should not follow the GM diet continuously. It is actually meant to be a quick way to lose weight. But, doing it more often may weaken you a bit. So, it is advised to give a gap of at least 4-7 days before starting another set. For better results, try to rest for a week before starting it again. Meanwhile, try to maintain a healthy lifestyle or else you’ll end up gaining all the pounds (see Q11] you’ve lost through the diet. Q19] Can we use oil to cook the vegetables and meat? Ans] Yes! But only Olive oil is suggested for cooking the foods while on the General motors diet program. Q20] Can people with diabetics follow the GM diet? Ans] No! People who’re suffering with hypertension, diabetes and heart problems are advised not to follow the General motors diet program. These people require a well-balanced diet in order to recover from their illness and since the GM diet doesn’t fulfil the nutritious requirements of such people, it is recommended not to follow it. Q21] Does GM diet reduce my belly? Ans] Well, you can lose at least 4 to 6 kgs per week by following the diet. But, what you must understand here is that the weight loss you achieve through the diet is overall, and your belly is also one area from where you’ll shed some fat. So, if you’re doing the diet to lose the overall weight, then you may go for it, but if you’re planning to lose fat from your belly or specific area in your body, then you should opt for specific workouts instead of the diet. These are just a few common doubts raised by the followers of the General motors diet and we’ve tried to cover most of them. In case if you’ve any more queries, please don’t hesitate to drop your comments below.